Here's another movie that is in my top five and that I've seen more times than I can count. Up In Smoke is, to me, just a brilliant comedy. The story is okay, but it's the characters that make this movie classic. Cheech and Chong themselves are gold, but then you have actors like Tom Skerritt (Strawberry), Stacey Keech (Sgt. Stedenko), and Christopher Joy (Curtis) who all totally own the scenes they're in. Just writing this makes me want to watch this movie. For this mini-set I chose a 1977 Topps Star Wars inspired design. Up In Smoke was released in 1978. I diverted from what I always aim to do with my cards which is match the year to the card design. The reason I chose to do this with these cards are for one the design is so iconic and synonymous with the '70s, and I wanted the green border for reasons that I hope are obvious. I found a Star Wars-esque font for the movie title which really was a fun touch for these cards. 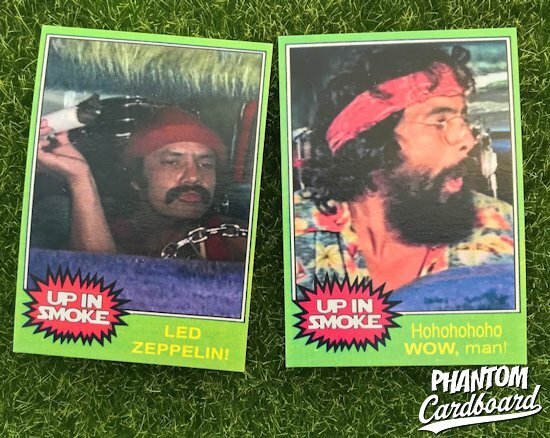 I started with just the Chong card that I made a while back. 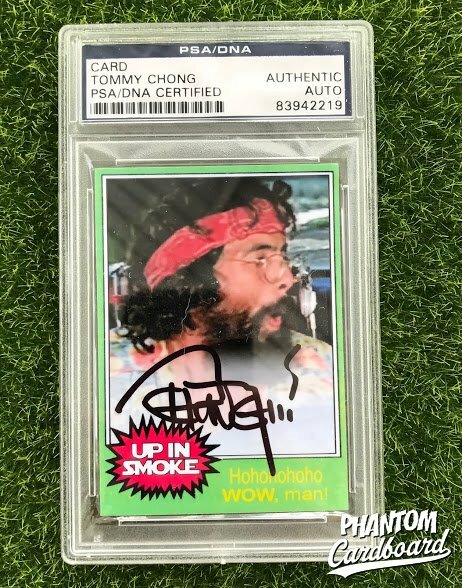 This is when my primary focus was making cards that I had a good chance at getting an autograph on and Tommy Chong is a good TTM signer, as well as having one of coolest signatures ever incorporating a joint into his John Hancock. Keach was the perfect square foil for this film and Louisa Moritz was a total fox. 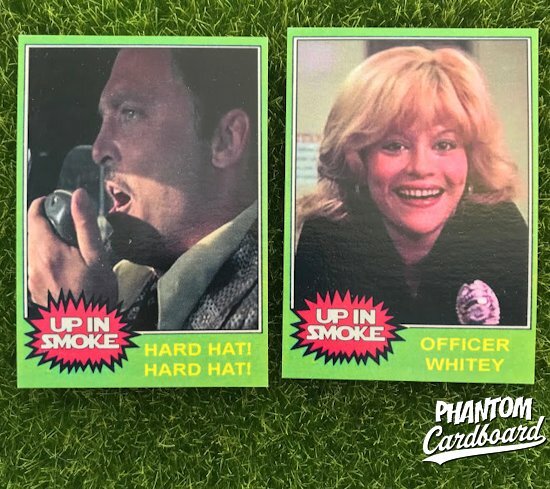 Now that I've been having fun expanding my single one-off cards into mini sets I've added 5 more cards to Chong's. The biggest problem I've been having with making these"mini-sets" is actually keeping them mini. 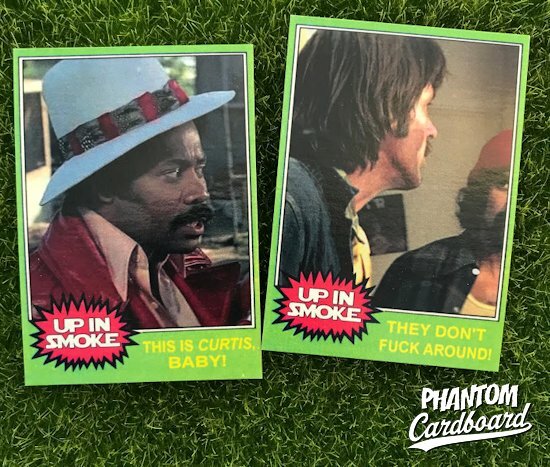 Some times I'm thankful when I'm limited by the number of images out there because for a movie that I love as much as Up In Smoke it could have easily turned into full blown set that takes you from start to end instead of highlighting a few of the characters. I would love to add a couple more cards to this set if I could find the right images. Scenes like the Ajax girl, the battle of the bands and so on. We'll see if any ever pop up. This card here is one of my absolute favorites of my signed custom card collection. I'd go so far as to call it a "prized possession". I got two signed and gave one to a good friend of mine. He loves Up In Smoke every bit as much as I and is somewhat of a savant when it comes to quoting exact lines with all the proper voice inflections.